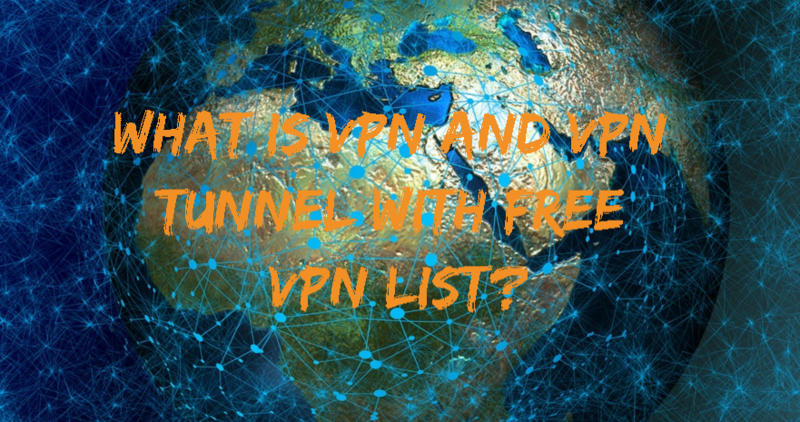 What is VPN and VPN Tunnel with Free Vpn List? Virtual Private Network simply VPN is one of the most known IT term between people. What is VPN? Virtual means the network or tunnel we will create is virtual not a physical network. This virtual network is isolated from existing public networks. Private means this network traffic will not known, seen from parts we do not want. Only we and the remote part which is generally a web site or a web service will have information about the network traffic. VPN can be used to hide regular internet users from governments, ISP, other users or attackers. VPN can be used to access a web page or web service. Also peer-to-peer file share is another popular usage area of users where they want to hide themselves ISP’s for copyright issues. Governments also uses VPN which is deployed in their own infrastructure to secure communication between government systems. VPN is an umbrella term used to define VPN protocols. There are different type of protocols used for different needs. In general all this VPN protocols provides Confidential, Integrity, Availability if they are configured properly. Below we will look most known and popular VPN protocols and their abilities. Internet Protocol Security is initially developed for IPv6 and then adapted for IPv4. IPsec encrypts packets in IP level and put some integrity and confidentiality check mechanisms for these packets. IPsec is hard to implement and operate protocol because of the components and security levels. Secure Socket Layers or Transport Layer Security is most popular VPN protocol used most of the web sites and networks. SSL/TLS works on TCP layer and very easy to implement. A simple browser and java with required features can be used to connect a VPN site. Another advantage of SSL/TLS VPN is that can connect through NAT without problem. Datagram Transport Layer Security is similar to SSL/TLS. DTLS is used for UDP related VPN’s differently from SSL/TLS. Cisco AnyConnect VPN uses this protocol. Microsoft Point-to-Point Encrytion is Microsoft solution for VPN needs. MPPE uses PPP and PPTP protocols for tunneling and encryption. MPPE also provides data compression. Secure Socket Tunelling Protocol is new suite provided by Microsoft to the Windows users with Windows Server 2008 and Windows Vista . SSTP is mainly developed around PPP and SSL 3 channels. SSH is actually remote management protocol which provides secure connection to the remote system. SSH have more abilities like providing secure channels for specified ports like a proxy. Local port can be forwarded to the specified remote port. SSH is very simple to setup. Quality article. I have been using NordVPN for the last 1.5 years and to be honest, I didn’t really understand HOW it works and WHY it works. Thank you, now it’s a lot clearer.